Disney-Pixar comes together to produce a visually stunning animation that tells the story of a boy who is restricted from music. The story is inspired by the Mexican holiday Day of the Dead, commonly called by its Spanish name Dia de los Muertos. Twelve-year-old Miguel has a passion in his heart he just can’t part with. On his journey to prove himself, he and his dog, Dante, find themselves in the colorful land of the dead. The visuals of the animation in Coco are absolutely extraordinary, the colors prominent and the details well executed. The comedic standpoint of the film was actually quite surprising, especially with the smart aleck comments that were made. It also came with a full on rollercoaster ride of emotions. The movie is set in the fictional Mexican village of Santa Cecilia, where Miguel’s family, a long line of shoemakers, is not fond of music or anything music related. Miguel’s great-great-grandfather left his family to follow his musical dreams resulting in every generation after banning music within the family. Despite his family’s feelings toward it, Miguel is fascinated with the world of music. He wants to become a musician like his idol Ernesto de la Cruz, a well known singer-songwriter and film star who died in an unexpected accident involving a giant bell crushing him during a live concert. The freak accident had the audience laughing hysterically. Because of the ban, Miguel isn’t allowed to enjoy music unless it’s in secret. When Miguel attempts to participate in a talent contest using a guitar he hid from his family, his grandmother finds and destroys it, which causes him to run away. By doing so, Miguel finds himself in de la Cruz’s mausoleum to steal his guitar to use in the contest. While in the mausoleum, Miguel strums the guitar, which causes him to become cursed and turned into a ghost. Nobody in the living world can see him except for Dante. Frightened by the fact that no one can see or hear him, Miguel runs around the cemetery, where he encounters family members in the afterlife. They agree to help him return to the world of the living. The songs are well done. 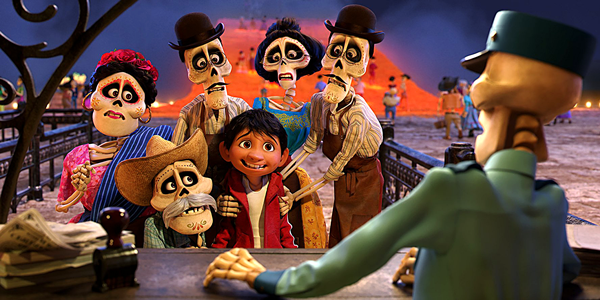 The catchiest is “Un Poco Loco,” which Miguel sings at a competition in the land of the dead in hopes of meeting Ernesto de la Cruz. Overall, the fact that Pixar put in so much work to make sure this movie accurately portrayed the Mexican culture makes it that much better. The characters themselves, aside from other detailed aspects, sure look like they are of Mexican ethnicity. All in all, this movie was a fantastic look into the Mexican culture and the Dia de los Muertos holiday. It represented the culture well and is an outstanding movie for all ages. Coco was released in Mexico Oct. 27 and will be released in the U.S. on Nov. 22.